A native of New York, Mr. Shultz graduated from Princeton University in 1942. After serving in the Marine Corps, he earned a PhD at MIT. Mr. Shultz taught at MIT and the University of Chicago Graduate School of Business, where he became dean in 1962. He was appointed Secretary of Labor in 1969, Director of the Office of Management and Budget in 1970, and Secretary of the Treasury in 1972. 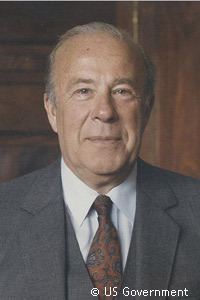 From 1974 to 1982, he was President of Bechtel Group, Inc.
Mr. Shultz served in the Reagan administration as Chairman of the President’s Economic Policy Advisory Board (1981-82) and Secretary of State (1982-89). He chaired the Shultz-Stephenson Task Force on Energy Policy at the Hoover Institution, the Precourt Institute for Energy Efficiency Advisory Council at Stanford University, and the MIT Energy Initiative External Advisory Board. Since 1989, he has been a Distinguished Fellow at the Hoover Institution, Stanford University.